Stéphane Duval was born in 1970 in Rennes. Very early on, reading the Tintin albums made him want to go into comic books. This desire was quickly reinforced by the discovery of American comics, with authors such as Gene Colan, Johan Buscema and Frank Miller. At the same time, he became fascinated in the works of Tardi, Muñoz and Sampayo, Comes and Bourgeon, through the magazine A SUIVRE. At the end of the 1980s, he participated in the Rennes fanzine ATCHOUM, created by Pascal Bertho and Marc Cantin. This gave him the opportunity to work in a studio with authors such as Erwan Lesaëc, Malo Kerfriden, Jérome Lereculey and Erwan Fages. His meeting with the scriptwriter Pierre Dubois in 1990 led to a first album, “Bonnie Tom”, which was published in 1992 by Delcourt. Six albums followed with the same scriptwriter for the same publisher (“Les Lutins”, four volumes, and “Red Caps”, two volumes). 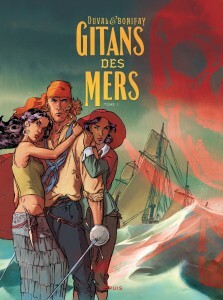 Then there was the series “Janet Jones Photographe” with script by Dieter (three volumes published by Delcourt), then “Chevalier Malheur” with script by Pascal Bertho (three volumes also published by Delcourt). 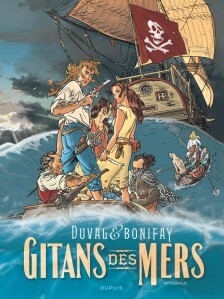 In 2004, he and Pascal Bertho thought up the idea of telling the saga of a Viking heroine, and in June 2006, the first volume of this series, “Aëla”, was published by Éditions Dupuis. The second volume followed soon thereafter at the beginning of 2007.